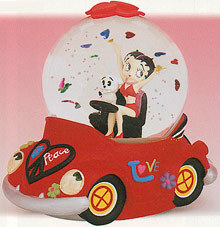 This is part of the Betty Boop Motion Musical Waterglobe series. Each motion muscial features Betty Boop in a glittering waterglobe and a lovely tune. Each motion musical is approximately 6" tail.